Old Hollywood b-movies were never shy about using extremely literal titles to tell audiences exactly what to expect. This one is perhaps the most literal of noir pictures I’ve seen. It’s just one of eight, count ‘em eight, film noirs movies included in the latest Warner Bros Film Noir Vol. 5. Despite including pictures from Don Seigel, Anthony Mann, Edward Dmytryk and Vincent Sherman I chose this one, because well, it was listed as 63mins, and thus could sneak it in fast, and well, the title was just too intriguing to ignore. And Richard Fleischer is no slouch either, but more on that later. Indeed Armed Car Robbery is about an armed car robbery. 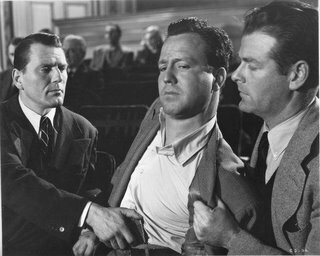 William Talman is Walter Purvis the mastermind of a new heist job which, if all goes right, will make he and his buddies rich. Purvis is tough as nails and clockwork in his method, but the job doesn’t go quite right, and one of the gunmans, Benny, is shot and injured. Despite Benny’s pleas he can’t go to a hospital, and after a confrontation is shot and killed. With Benny found for dead it gives the cops the one lead to track down Purvis and the money. A cat and mouse chase between cops and robbers ensues with a buxom stripper named Yvonne Le Doux at the centre of it all. Armored Car Robbery works best as an iron clad procedural in the traditional of the crime work of Michael Mann. In fact the rhythm and construction of the police investigation with the perps' escape recalls the Pacino/De Niro dynamic in Heat. On the side of the cops is the equally ruthless hardliner Lt. Cordell (Charles McGraw) who, like Pacino’s character, commands his troops and analyzes the evidence with workmanlike efficiency. But let’s not aggrandize this film too much though, Heat this is not, nor is it M, or High and Low, the two essential classics of the procedural genre. In Robbery we never quite sure who to root for. Most often in heist films we cheer for the robber, who often steals for a purpose other than just money, or for the fact that they are charming or charasmatic. Purvis is no hero, not even an anti-hero, and thus we never really feel any warmth or attraction to him. Is it the cops? Do we want the cops to catch the thief? Unfortunatly Lt. Cordell is thinly drawn, not much deeper than a mere characterization of a cop instead of a hero with a journey. As such this noir is simply an exercise in style – a series of crafty set pieces choreographed and directed with considerable flare by director Richard Fleischer, who is certainly no hack – a director who would go onto a successful career of populist entertaining classics such as the Fantastic Voyage, 20,000 Leagues Under the Sea, Soylent Green and even all the way up to 1984’s Conan the Destroyer. Armored Car Robbery is available in the Film Noir Collection Vol 5. from Warner Bros Home Video.